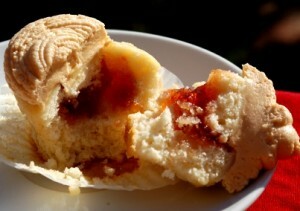 I have to thank Fanny for hosting this fun event, and for inspiring me to make these peanut butter jelly cupcakes. Who does not love sugar and cupcakes! Fanny, over at Foodbeam is hosting this month’s SHF. If you have not heard of Fanny or Foodbeam, you really should rush over there (after reading this post – wink wink). She is delightful and her pastries will have you drooling over your keyboard in no time! This is my first-time par-taking in SHF, usual,ly I am too busy and/or there are two many sweets laying around from my other baking groups. This time, I knew I had to make the time as the topic is dear to my heart! I have always held a special place in my heart for cupcakes. They are cute! Delicate! Soft and fluffy! And ever so sweet! Most of all, it reminds me of my grandfather, as he use to call me cupcake! I don’t have many memories of him, unfortunately, he passed away while I was young. But, I do remember the smell of his pipe on him. To this day, I can smell that sweet smell of tabacco (burnt sugary/vanilla smell) a mile away. As well I remember being small, looking up at him, a smile across his face and him calling me “cupcake”. He use to be a conductor on the train and I loved going down to the tracks, waiting for the train to pull into town, so I could wave to him and have him wave back! I really wish, I could have had more time to really get to know him, to continue smelling the smell of his sweet pipe and to make many many cupcakes for him. This post is dedicated to him! I have been craving white bread with peanut butter and strawberry jam for the past month, probably this crazy diet I am on! As well, I knew I had to send my mother something sweet for her birthday, so I decided to combine, Fanny’s event and my cravings … the outcome was a Peanut Butter and Jelly Cupcake. I always use the Magnolia Bakery’s recipe for my base cupcake, this time I did add extra vanilla bean. To assemble the final little bit of the party in your mouth, I cut a small part of the top of the cupcake off and scooped a bit of the moist cake out, and stuffed it full of Strawberry Jelly (I wanted the seeded jam, for visuals, but our market was out of it, go figure) into it. 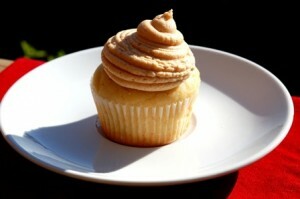 Then I make a cream cheese peanut butter frosting for the top. The end result: the cupcake was fragrant with the vanilla bean added. The peanut butter frosting was not overly sweet, instead, it was ultra creamy with the addition of butter, cream cheese and peanut butter. It tasted not like your traditional P&J, but more of a “urban” P&J; must had been the vanilla bean! Next time I want to stuff it with chocolate – deconstructed peanut butter cup … YUM! 4 Responses to "Peanut Butter Jelly Cupcakes"
Aw! Your cupcakes are very cute! PB&J is a brilliant idea! They would go over big here. Very sweet of you to dedicate this post to your dad, too.